I was thinking about this today. I went out and bought some cool "parchment" style cardstock and plan on making myself some spell cards. My plan was to settle down for a few hours and copy some spells into Word, then totally re-do the table layout. Then it occured to me: the Beta download from last year is formatted with one spell per page, right? I don't recall how many changes occured to the spells in the past year, and I know that the Beta doesn't have all of the spells, but I'll bet you could just print off what you want from the Beta and wouldn't have to re-format anything. It might not totally match the final core rulebook, but I suspect it would be pretty decent anyway. And many of the pages have cool artwork on them. I'm kind of bummed that no one has a thought on this. I went ahead and printed some spell cards from the Beta and am counting the charts as "official." Seems to be working just fine and they look nice. I can haz copy plz? I think this sounds great, but I have no idea where to find the Beta download. Could you please point me toward it? 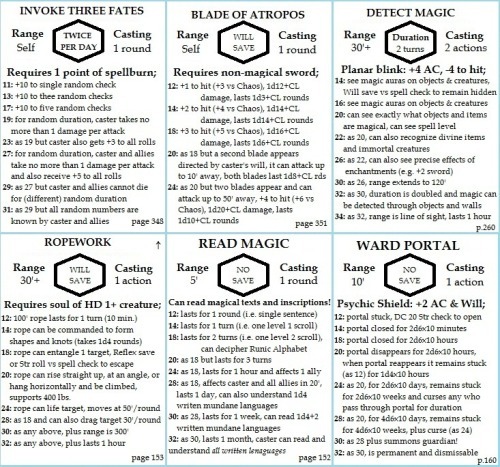 I would gladly pay a few extra bucks to Goodman Games for a pdf download that listed the individual spells in single pages that we could print as needed. It would also be a good way of fixing the spells that have errors in them (ie. I know one of the patron spells is missing an entry). I suppose the concern may be that people will look to purchase this instead of the full pdf just to borrow the spell system. Maybe they could charge $5 or something to reach a happy compromise? Just curious if anyone has completed this for all of the spells? A stack of Spell Cards would make a super useful tool. When I write down spells on a character sheet I'm just planning on writing page numbers and the unique manifestations and mercurial magic effects. Sorry for the confusion. By "beta" I meant the free download that everyone could do in June, 2011. The "open playtest" PDF version that had character levels 1-5 and so on. I wasn't referring to any secret files that only I could access. I guess I assumed that it was still online somewhere. EDIT: Just rechecked the Goodman main website. I found the old link, but it goes nowhere. Guess the Beta is now no longer an option for folks, and sorry for the confusion. Because my players aren't familiar with everything their magic can do, I wrote up my own spell "cards"
Keep in mind, these are customized to the PC with mercurial magic effects written in so some of the numbers may look a little... off. Not to get too retro, but a spell book of single one page loose leaf paper would be bad @ss! Retro harn, Monster Manual type. so that a player could literally build a spell book. havign the ability to have the mecurial effects in there would be super cool, but might be to unique for a mass produced item. bottom line: get the spells the conform to 1 sheet of paper. Hey wasnt someone on the board working on that project?